Paper remains a handy medium at the time of computerization of our societies, and because both mediums complete each other, professionals are not ready to do without. 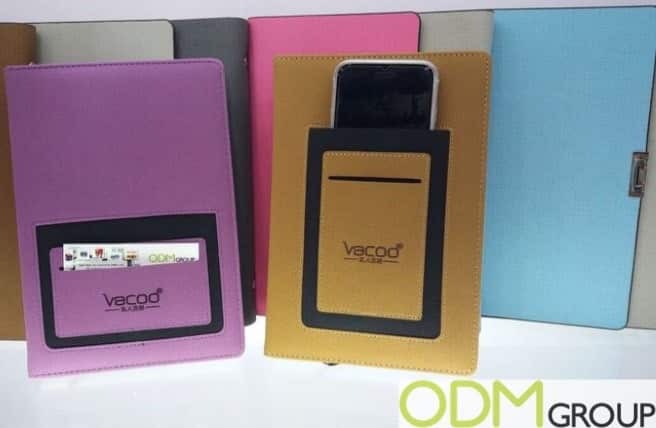 This branded PU notebook with card pocket will experience a great success with companies whose organization is a key point, and serve as a marketing communication support for any brand. Use reference code ODM-1551 to get a quotation! Your customers will leave their laptop on their desk and travel light, share their notes and keep in touch with the people they meet with ease. These notebooks can serve as a notepad to take notes in a meeting as well as to write down all your projects, your business plan and budgets. Why do we like these Branded PU Notebooks? High-quality. Brand-able and customizable, this branded PU notebook has been designed on a very high-end PU material. It will help to spread the word around your brand. Practicality. Another reason to adopt this is that it comes with a card pocket. This new design has been modeled, so that you can conveniently carry your phone at the same time as the notebook. It is small enough to put into a bag but also large enough to easily draw and write on. Design appeal. These branded PU notebooks are available in a wide range of eye-catching colors. This is a great point because it will allow you to chose a color according to the one that symbolizes your company, and this will help customers to identify you. At ODM we have significant experience in product design, sourcing and manufacturing. We can help you with your marketing budgets effectively. Be sure to contact us if you are interested in finding out more information about branded PU notebooks.